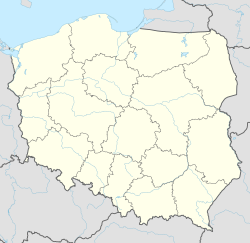 Dobrucowa [dɔbruˈt͡sɔva] is a village in the administrative district of Gmina Tarnowiec, within Jasło County, Subcarpathian Voivodeship, in south-eastern Poland. It lies approximately 9 km (6 mi) east of Jasło and 44 km (27 mi) south-west of the regional capital Rzeszów. Some two thousand Polish Jews were murdered in mass executions at the Dobrucowa Forest in the fall and winter of 1943, on the orders of SS-Hauptsturmführer Amon Goeth from Płaszów. They were transported there from the Szebnie concentration camp during camp's murderous liquidation. ^ Jacek Bracik, Józef Twaróg (2003). "Obóz w Szebniach (Camp in Szebnie)" (in Polish). Region Jasielski, nr 3 (39). Archived from the original (Internet Archive) on February 1, 2010. Retrieved 4 July 2013. ^ United Nations War Crimes Commission (1 September 1997). Law Reports of Trials of War Criminals. Wm. S. Hein Publishing. pp. 1–10 (Case no. 37). Retrieved 6 July 2013.